COREE DU SUD – – Seoul - A hat which belonged to South Korea’s most revered monarch King Sejong has been recovered more than 500 years after it was looted by Japanese invaders, a senior scholar said Wednesday. Apart from its intrinsic value as an historical relic, the discovery has thrilled scholars after documents were found stitched inside the hat carrying explanations of King Sejong’s greatest legacy — the Hangeul alphabet. The monarch known as Sejong the Great ruled from 1418-1450. His reign had a profound impact on Korean history with the introduction of the Hangeul phonetic alphabet that replaced classical Chinese characters. Hangeul vastly increased literacy — previously restricted to the top scholarly class — and remains the official script of both South and North Korea. The king’s statue occupies an honoured place in the centre of Seoul. Lee Sang-Gyu, a professor of Korean language and literature at Kyungpook National University, told journalists that the Ikseongwan (cicada-wing hat) was purchased in Japan last year by a South Korean collector. “This hat will help shed light on details on the creation of Hangeul and ancient royal costumes,” Lee said. The documents are believed to be at least two years older than the hitherto oldest documents explaining the principles behind the creation of the Korean alphabet, he said. The hat is believed to be one of many royal relics looted during the Japanese invasions of Korea in the 16th century, Lee said. The outside is composed of pieces of brown and dark cloth embroidered in gold, and the inside of fine red cloth. The documents were found hidden in between the two. The unidentified local collector has decided to donate the relics to the state, Lee said. TURQUIE – Myra - Construction work has started on the establishment of the Lycian Museum in the southern province of Antalya’s Demre district. The open-air museum will be constructed in the Roman granary in the Andriake port of the ancient city and trade agora of Myra. As part of the project, which is expected to be finished on Nov. 25, 2013, a granary will be turned into a museum for the first time in Turkey. 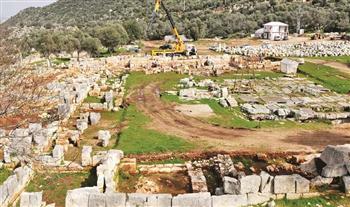 The Hadrian granary, which dates back to the Roman period in Andriake, will be the enclosed portion of the Lycian Museum. The granary, which was one of the largest in the Roman period, was constructed in 126 A.D. and is made up of seven rooms, each of which is 65 meters in length and 32 meters wide. The new structures that will be revealed in the trade agora and the Andriake Port City will be the open-air sections of the museum, where the region’s artifacts will be displayed. IRAN - - The first phase of the project to map all of Iran’s archaeological sites has been completed by a team of experts. The map was unveiled during a ceremony at the Cultural Heritage, Tourism and Handicrafts Organization (CHTHO) in Tehran on Monday.A total of 45,000 archaeological sites appear on the map, team director Abbas Moqaddam said at the ceremony. The second phase of mapping Iranian archaeological sites would be completed in 10 years. 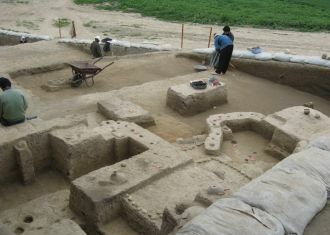 NOUVELLE ZELANDE - Almost 800 long-buried bodies around Central Otago may have been rediscovered by an archaeologist. Armed with a fluxgate gradiometer and a hand-held GPS unit, Dr Hans-Dieter Baderwalked over more than 25sq km of cemetery ground around Central Otago in May last year. The machine measured magnetic variations in the earth that indicated where soil had been disturbed and from that, Dr Bader, of Auckland-based Archaeological Solutions Ltd, identified possible unmarked graves. Maps created during the geophysical survey were laid over aerial photographs of the cemeteries, in collaboration with Otago University's Southern Pacific Archaeological Research, to provide a map of all graves, marked and unmarked. His report, released this week said most of the unmarked graves were likely to date from before 1900. EGYPTE – x Gizeh - Egyptian antiquities officials have confirmed to Bikyanews.com that a pipe has burst inside the museum holding one of pyramid builder Khufu’s boat. The ancient boat has been restored and is a major pull for tourists heading to the Giza Pyramids. Khufu is also the 4th dynasty King who erected the largest of the three pyramids, which has been named after him. One official said late Monday night that the “sewage pipe in the building has exploded. We are looking into the situation and are not sure if any damage has happened.” Activists and archaeologists have begun spreading the message on Twitter and other social media networks as they fear for the destruction of the ancient boat. 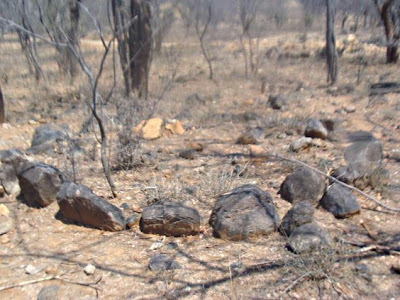 INDE – Male Mahadeshwara - Over 20 megalithic stone circles dating back to about 800 BC were discovered at Male Mahadeshwara Hills in Chamarajanagar district, according to T. Murugeshi, Associate Professor in the Department of Ancient History and Archaeology, MSRS College, Shirva. In a press release issued here, Mr. Murugeshi said that Megalithic Culture or Iron Age has been considered as a formative period in the South Indian history. He said that he had gone with R. Gopal, Director of State Archaeology, Mysore, on a survey of a deserted temple at Alambady on the right bank of River Cauvery on the Male Mahadeshwara (MM) Hills near Gopinathapuram in Kollegal taluk of Chamarajanagar district on February 27. They had gone on a survey of the temple on a request by Pattada Immdi Mahadeva Swami of Saluru Bruhan Math. On the right side of the Hogenkal Falls, they noticed a number of megalithic stone circles on the slopes of the MM Hills. Locals call the site ‘Mari Kote’. A number of stone circles and cairns were found at the site. Usually, it is not possible to identify the kind of burial by looking at the surface. But some burial sites had already been robbed by treasure hunters, so it helped them identify the type of burials.“In one of the exposed site, four orthostats making a box-like square, without port hole was found. On the basis of this feature, we recognised them as stone circles consisting of Dolmenoid cists. More than 20 stone circles were spread over there”, Mr. Murugeshi said.